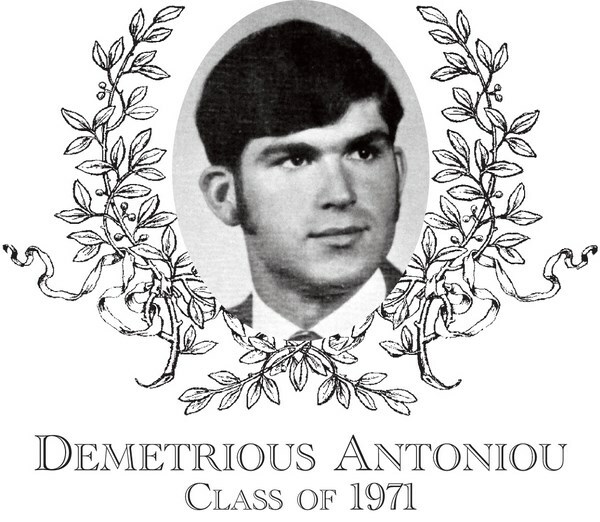 When one thinks of the chief �pioneer� in the sport of boy�s soccer (1968) at Bartlett High School, one thinks of Demetrious Antoniou, Class of 1971. In 1966, DemetriousAntoniou, along with his family, migrated from Greece to join his mother�s family in Webster. In the spring of 1968, Demetrious with a couple of fellow student soccer enthusiasts, presented a student petition to BHS Athletic Director, Sigmond Strzelecki, for the sport of boy�s soccer to be implemented at BHS � and it was approved for a September, 1968 start!! Soccer had arrived in Webster! Demetrious was to prove to be a �pioneer�, (spearhead; originate; to set in motion; lead the way; be the first of a particular kind) promotingWebster based soccer. He received many deserved accolades by former teammates, such as: �being very talented; a dominant player; excellent skills; looked up to by the rest of the players on the team; a great representative of BHS soccer�. The 1968 team achieved a record of 6-5-1. Demetrious was a standout center midfielder. The 1969 team proved to be exceptional, exhibiting relentless offense and tenacious defense and winning its first 11 games, scoring 67 goals and allowing 9. BHS was selected to the State Tournament and went on to defeat Quabbin Regional before losing to eventual State / New England Champion, Ludlow. A Webster Times article, stated �in only its second season of play, Bartlett has established itself as one of the teams to beat in Central Mass; Antoniou has been the chief offensive standout�. Demetrious would serve as a captain of the l969 team; lead the team in scoring with 50 points (18 goals and 14 assists) and win MVP honors. Turning 19 for his senior season, he would be age ineligible. Yet, a determined Demetrious joined Coach Don Cushing as the assistant coach and attended every practice and game in helping to lead the Green and White to an undefeated 1970 regular season. He went on to UMASS and played soccer his first 2 years before �taking off educationally� in the spring of his sophomore year with his Micro-Biology major. He graduated from UMASS (1975). He and his wife, Margaret, have three children, Alexanda, Michael, and Margaret. He is presently an ENT Surgeon practicing in Portland, Maine since 1987.